May Day is our day. It is International Workers Day. It is a day that is all about us, working and oppressed people, and our fight for a better life. The wealthy, the powerful billionaire class that rules this country, wallow in luxury 365 days a year. On May Day, we say, “Enough!” We are tired of being held down, pushed around and sold out. We cannot accept things the way they are. In every region of the globe, from the streets of Europe to the countryside of Latin America, from the Philippines to Palestine and in the U.S., working people will come together on May 1. We urge everyone to help organize and participate in the many events marking May Day across the country. The origins of May Day are in the class struggle right here in the U.S. In 1886, a powerful fight for the eight-hour day arose. A call was issued for a general strike, and in Chicago many responded. On May 4 a clash took place at Haymarket Square. This was used as a pretext to hang four revolutionary labor leaders. In subsequent years, the tradition of workers standing up on May Day to advance our cause was born. 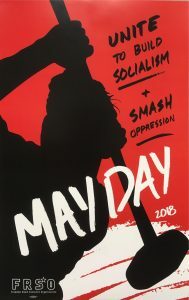 During the Cold War, the ruling class attacked everything progressive – and they went so far as to rename May Day ‘Law Day.’ But you can’t keep a good thing down. In 2006, a great upsurge, the mega-marches for immigrant rights, revived May Day. Over the past year there has been a real upsurge in the people’s struggle and in the year ahead everything possible should be done to add fuel to the fire. On April 18, thousands marched on the Supreme Court in Washington D.C. in support of Deferred Action – a measure that provides relief from deportation for millions of undocumented people. In the coming year, the struggle to obtain legalization for all will be one of the key battles. In cities across the U.S., particularly in African American communities, hundreds of thousands have marched and participated in militant protests against the epidemic of police killings and violence. There is no doubt that this storm of struggle will grow in intensity and that more will follow the example of Chicago in fighting for community control of the police. This country is one big prison house for the oppressed. The African American, Chicano and Hawaiian nations are held in chains. Racist discrimination, along with national oppression is visited upon all oppressed nationalities, including Latinos, Native Americans, Asians and Pacific Islanders. Oppressed nations need liberation and self-determination and all oppressed peoples need full equality. Workers are on the move. The fight of the 40,000 Verizon workers on the east coast is a testament to this. Another example for the entire labor movement is the courage and determination displayed by the Chicago Teachers Union. Then there is the heroic Kohler strike in Sheboygan to defeat the two-tier wage system – it shines like a Wisconsin lighthouse, in a state with massive battles against anti-union ‘right to work’ laws. In an unequal fight, the working class of Wisconsin has time and again resisted anti-labor legislation and, in those battles, a militant organization of the trade unionists has been born – the United Workers Organization. The capitalist system is an evil system. At its core is exploitation of the many for the benefit of the few. The political representatives of the wealthy such as Trump or Clinton have nothing to offer us but more of the same. Trump, a right-wing populist, is an open advocate of racism and reaction. The Chicago students who shut down his campaign event did the right thing. Trump should be confronted and shutdown where ever he goes. America’s rulers have built an empire of injustice that spans the globe. Those who are fighting back – in the Philippines, the Middle East or anywhere else – deserve our support. In the billionaire class, which includes the rich bankers who are robbing people at home and abroad, we find that we in the U.S. have the same enemy as people around the world. On May Day, international solidarity needs to be front and center. So does the fight against repression. Over the last five years the FBI and so-called Justice Department have lashed out at anti-war and international solidarity activists. They tried to imprison veteran Chicano leader Carlos Montes on the flimsiest of pretexts. Now they are going after longtime Palestinian leader Rasmea Odeh. We must stand with her and anyone else facing political repression. The capitalist system, and those who stand at its apex, give working people a million reasons to hate it. We look around this country – at dangerous clowns like Trump, unemployment, crummy jobs and endless wars and know that we can do better than this. Capitalism is a failed system. It can and will be abolished and replaced with socialism – the system where the political and economic power of the country is in the hands of working people. Long Live May Day! Long Live International Workers Day!